Anna Cooke put a fine art career on hold to enter the advertising world. The name Anna Cooke became synonymous with creative excellence as she went on to become a celebrated art director and then creative director of international renown. Her award-winning design work for industry giants ABC, D&B, and others, eventually led to an agency partnership which exists to this day. Anna Cooke is also co-founder and editor of the awarding-winning dog magazine, The New Barker. "What matters most is what you have done, not what others have done to you." It Is Better to be Outspoken, Than Unspoken. by Anna Cooke, Editor, The New Barker dog magazine. Michele Lazarow, Vice Mayor of Hallandale Beach, has played a big role in the movement to ban the sale of puppies and kittens in Florida retail stores. It is a movement that has taken hold in cities across the country. Michele Lazarow with her two dogs Honey and Gidget. Lazarow purchased a puppy from a Hollywood pet store about 14 years ago. Alfie had been marked down to $900, and he was chronically ill until he died at the age of 10 in May 2014. Lazarow’s heartbreaking experience both angered and inspired her. In 2011 she began a crusade to ban retail puppy sales in Hallandale Beach by first sending packets of information to City Commissioners. It wasn’t easy, but after a year, she was finally able to get a law on the books. Lazarow’s aim is to protect the consumer who might not be aware of their rights under the state’s puppy “lemon” law. The statute provides legal recourse for consumers who buy cats or dogs that become ill or die shortly after purchase. Early on, Lazarow was the face of this movement in Florida. “But now officials are doing this on their own,” she said. Having led protests outside pet stores, educated officials and counseled people who needed advice after coming home with a sick puppy, Lazarow’s dedication to the cause has won her both friend and foe. Lazarow has helped lead the fight for most of those bans by talking behind the scenes with city officials, rallying local animal advocates to become involved, and speaking out at public meetings. She makes no apologies to her naysayers. The next big issue in the upcoming 2019 Florida Legislative Session will be pet store lobbyists attempting, once again, to preempt local municipalities from puppy mill ordinances. “We’ll be ready,” said Lazarow. Also, join Change Animal Welfare Laws in Florida and Beyond on Facebook for updates. During the 2019 Florida Legislative Session, consider attending Humane Lobby Day on March 12 in Tallahassee. You’ll learn more about the issues and how you can help. Learn More About Florida’s Humane Lobby Day in Tallahassee. By Anna Cooke, Editor of The New Barker dog magazine. What is Humane Lobby Day? It’s the biggest day of the year for animals and animal advocates. The annual national event is sponsored by the Humane Society of the United States. Citizen animal advocates gather, at the state level, to learn and practice lobbying protection laws in each state. The full-day event includes a lobbying workshop and an overview of relevant bills in your state legislature. Appointments are made for you with the legislatures who represent you. You will be given specific talking points for visiting with the legislators and/or their staff, face to face, and ask them for their animal-friendly votes. When and where is Florida’s Humane Lobby Day? March 12, Florida State Capital; Challenger Learning Center, 200 South Duval Street, Tallahassee. 9:00 a.m. to 4:00 p.m. (9a-Noon/workshop and lunch; 1p-4p appointments with legislatures). What legislation will we be discussing? Two bills of particular interest to The New Barker dog magazine: Strengthening the penalty for killing a K9 Officer: SB 96, HB 67. And, puppy mills – specifically stopping the importation of puppies from puppy mills. Florida is one of the leading states importing puppies and kittens that are used to stock retail stores. There are about 65 ordinances in Florida currently banning the retail sales of cats/ dogs and this number is growing. However, the preemption bills that have been considered in the legislature would remove those 65 ordinances and prevent any future ordinances form being passed. So we are fighting the efforts to preempt pet retail sales bans and educate our legislators about this issue. There has not been a preemption bill introduced yet this year, but the opposition (Petland) will likely try to amend it to a bill that’s moving, just as they did late in the session, last year. We have defeated them for three years now and will continue to fight it. But many of our legislators are not aware of this important aspect of preemption. This is why we need your vote and your voice. What should I do to prepare? No prior experience is required to get involved. The goal of the workshop is to educate you on the bills and provide the support you’ll need to make the largest impact. It is helpful to know who your legislatures are before going into a meeting with them. Most elected officials have a website. Also check out these two nonpartisan political organizations, each one encouraging informed and active participation in government: League of Humane Voters – Florida Chapter and League of Women Voters – Florida Chapter. Find your federal legislators at this link by typing in your zip code. You may also want to read more about Petland’s attempts to stop the banning of puppy mill sales in pet stores at the local level. Chief lobbyist for Petland pushing for legislation that would strip Florida cities of their right to regulate local pet stores. Can I partner with a friend so I’m not alone? It’s a great idea to bring friends and family to Humane Lobby Day. A large turnout creates a powerful voice for the animals. What should I wear? Dress professionally to meet with legislators. A business suit or slacks/skirt and a jacket are appropriate. Be sure to wear comfortable shoes; bring an umbrella and a photo I.D. RSVP Today by filling out this form. There is an $8 registration fee which will cover the cost of your lunch and materials. This is an amazing opportunity to meet with like-minded people from across Florida; to learn about the issues and how you can make a difference. And then, to go out and visit with your representatives in their offices. We hope to see you there. Author Anna CookePosted on February 18, 2019 February 18, 2019 Categories UncategorizedTags Dogs, Florida, Humane Lobby Day, Humane Society of The United States, K9s, law, life with dogs, lifestyle, Tallahassee, The New Barker dog magazine.4 Comments on Learn More About Florida’s Humane Lobby Day in Tallahassee. His Past Did Not Determine His Happiness. Jason and Sugar Mama – the dog who saved his life. Jason was released from prison in December 2016. “I’m beating the odds,” he told us. We spoke with Jason and his wife Crystal over a cup of coffee, outside Cappuccino’s Fine Wine & Espresso Bar in Dunedin in September 2018. 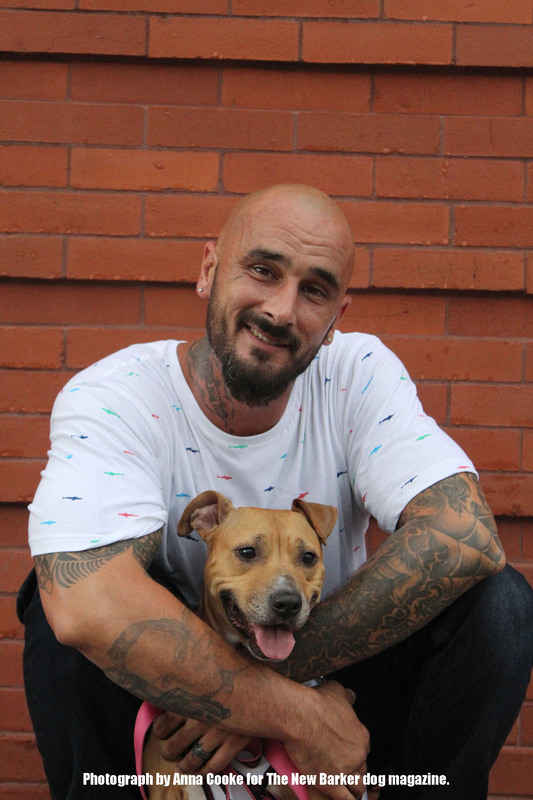 We met Sugar Mama, the dog who helped Jason change his attitude and turn his life around while still in prison. They were introduced by the TAILS program. TAILS (Teaching Animals and Inmates Life Skills) is a collaborative effort that brings together prison inmates and hard-to-adopt shelter dogs. Through partnerships with Northeast Florida shelters and the State of Florida Correctional System, dogs are placed in correctional facilities to be trained, socialized and cared for. The program was developed by First Coast No More Homeless Pets, now operated by Pit Sisters, a Jacksonville-based 501c3 organization that finds foster and permanent homes for hard-to-adopt dogs. Members of the Pit Sisters team assess at-risk dogs at the shelters to select candidates for the TAILS program, matching them with inmates signed up for the program. Pit Sisters also provides transport of the dogs to the correctional facilities. “TAILS benefits dogs, trainers, families, prison staff and the entire community,” said Jennifer (Jen) Deane, founder and executive director of Pit Sisters. Sugar Mama had been confiscated in a raid to break up a dog fighting ring. She ended up at Putnam County Animal Control. Jason was at the Jacksonville Bridge Community Release Center, a transitional program, when Jen brought Sugar Mama there in April 2016. The reality is, rehabilitation at the Department of Corrections doesn’t exist. In 2018, the Florida Legislature passed and Governor Rick Scott signed an $87 million budget that was $28 million short in prison funding. To close the gap, the Florida Department of Corrections began eliminating programs that prepare inmates for their return to the community. One of those recently closed was Bridges of Northeast Florida, the transitional program that Jason was in when he met Sugar Mama, almost two years ago. The goal of the TAILS program is to have the inmates train and socialize the dogs, readying them for adoption to families outside the prison system. After the eight-week program of living with and caring for the dogs, they are taken from the inmates, who know this going into the program. Jason knew it. When he finished the program with Sugar Mama, he would have four months left in the transitional program before being released into society. Four months without her. The rest of his life without her, if she was adopted by someone else. What makes the TAILS program unique is that it is not funded by the Department of Corrections. “Our program is the one vehicle that helps the inmates transition. We pair hardworking guys with positive reinforcement training that gives them experience and discipline, making them more employable when they’re released. They receive certificates from the program,” said Jen. “While we’ve seen a decline in recidivism, we’re working with a professor at the University of North Florida who is helping us pull those numbers together and quantify the benefits of the program. TAILS has been in existence for three years and all of the dogs have been adopted. Zero percent have been returned to the shelter,” said Jen. Jason has a lot going for him now, including a good job working as a technician for a heating and air conditioning company. He has a family – Crystal, Sugar Mama and the couple’s other dog, Emma, a Jack Russell Terrier. He has a home and a car. It’s the first time in his life he’s putting the needs of others before himself. He’s also become a spokesperson for TAILS, traveling to the facilities that have the program to talk to inmates. It costs $300 for a dog to go through the TAILS program. When sponsoring a dog, you’ll be able to choose your dog for the program and receive updates about the dog you are sponsoring.You’ll be invited to attend graduation where you’ll meet your sponsored dog, along with the trainers and the new adopters. “Never minimize any experience.” Jason Bertrand with Sugar Mama. by Tina K. VaLant for The New Barker. Dogs are devoted. Their jobs range from serving as police or military K9s, providing therapy and comfort, or acting as the eyes, ears and/or barometer of their human’s physical condition. We all know of special stories where a rescued dog laid their life on the line—-never looking back—-to alert their family of an intruder or fire, or even move a nest of tiny kittens to safety. 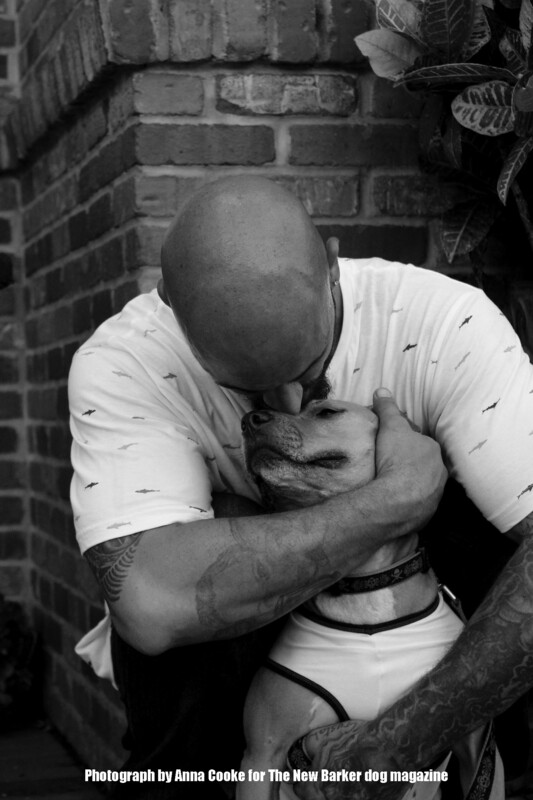 Often, these hero dogs are the greatly misunderstood pit bulls and pit mixes. Regardless of their DNA or physical appearance, dogs give unconditional love, loyalty, and companionship. Every so often a dog makes its mark, indelibly touching humans in ways we never forget. Ollie is such a dog. October 10, 2017, Hollywood, FL —- A passer-by heard whimpering coming from a suitcase on Lee Street. Police were dispatched to an abandoned house where they found a dog inside, mutilated and clinging to life. The young male pit mix was taken to VCA Hollywood Animal Hospital. Grateful Paws rescue agreed to be his sponsor. He was named Oliver. Volunteers took to social media to help with the mounting medical bills. In 36 hours, his story went viral, circling the globe, and igniting strong reactions. With over 4000 shares, donations and requests to adopt him came from as far away as Denmark and Germany. The account surpassed $40,000. It was always stated that additional funds raised after Ollie’s medical expenses were settled would assist other abandoned, abused, and/or neglected dogs coming into the rescue’s care. “We never imagined this kind of amazing, loving response”, stated Grateful Paws’ founder, Jan Milbyer. Dog lovers around the world rallied for Ollie, sending their prayers, best wishes, and gifts to him at VCA. His prognosis was guarded, yet hopeful. The Crime Stoppers’ and PETA rewards, combined with private donations swelled to almost $70,000, for information leading to the arrest. Due to the dogged, restless efforts of the Hollywood Police Department, on Tuesday, November 21, 2017 the prime suspect was arrested. He remains in custody, without bond, facing seventeen counts of animal cruelty, and the scorn of every person who rallied for Ollie. Even though he endured a horrific experience, when Ollie arrived to VCA Hollywood, he was nothing but wiggles, wags and kisses, despite his incredible physical pain. He wasn’t out for revenge. He was in the moment, feeling the kindness and energy surrounding him. He accepted their care, and responded well. Surely, he had to have been aware of the tens of thousands of prayers, well wishes and kind people rooting for his recovery. And then, two days later, his heart gave out. The VCA staff, vets and a cardiologist worked on him, for over an hour. But he was gone. Jan tearfully added, “The only redeeming thing is that Ollie did not die alone. His life could have ended in that suitcase, but Ollie stayed to serve as an ambassador to his misunderstood breed and brought thousands of dog-lovers together”. A loving memorial service was held for Ollie December 10, 2017. Over 200 attended and honored this brave, sweet dog. Ollie’s memorial at the Lee Street house, in Hollywood, FL where the blue suitcase was found. Paying respect is Blueberry, a rescued pit mix, who is also a service dog. Moving forward, what can WE do, to honor Ollie? Let’s make him proud. We can lobby to change laws, increase punishment and fines for those who abandon, abuse and neglect animals. We can assist more animals. We can be grateful that the person responsible is in custody—-unable to hurt another innocent animal. Ollie was not his only victim. There were cats, rats and other animals. May each victim know we are truly sorry for what they endured. Mostly likely, this person’s brutal behavior would have escalated. His potential victims are safe, now. Ollie’s memorial on December 10, 2017, at First Presbyterian Church in Hollywood. More than 200 people attended. Ollie’s story affected all of us, in many ways. It’s not always easy, but we can control our thoughts, words and actions. I do not refer to the perpetrator, by name. He does not deserve that respect. Let us not risk jeopardizing a fair trial. While operating from anger or rage, we may feel justified—for a moment, but it doesn’t last or contribute toward the highest benefit. Write a letter to the state attorney, hold the firm intention that justice be served and punishment will be the maximum sentence. We can emulate dogs, by being more mindful. Release judgment, bad feelings, the past, and things we have no control over, like Ollie. Be truly present. Cuddle our own pets a little longer. Leave our phones at home and prolong our own dogs’ walks. We can extend our hands, hearts and hugs to increase the level of love around us, for ourselves and our animal friends. Ollie, you left your paw print in our hearts. About the writer: Over the past twelve years, Tina VaLant has volunteered, photographed, handled surrenders, transported, completed home visits and fostered for Grateful Paws rescue. She has also been the South Florida rover reporter and photographer for The New Barker dog magazine. Tina saw a painting of Bailey, her niece’s rescued pit bull. “None of us knew Ollie before his tragedy. Seeing Bailey’s image really got to me,” said Tina, who contacted the artist. Susan McKenna List agreed to paint a much larger portrait, For the Love of Ollie. It was unveiled at The Art of Giving Back at Art Basel in Miami Beach, along with Ollie’s story. by Christine Dorchak for The New Barker dog magazine. History awaits the Greyhounds this fall. On Election Day, Florida voters will have the opportunity to turn back the hands of time and end dog racing in its most established state. As many as 8,000 lucky greyhounds stand to receive the second chance they deserve, closing out nearly 100 years of exploitation and cruelty. The first recognized commercial greyhound racetrack in the world was opened in 1919 in California. By 1930, sixty-seven dog tracks had opened all across the United States – none legal. No state would authorize this new business, even during the height of the Great Depression. But Florida was different. It became the first jurisdiction to allow dog tracks to operate legally – as long as it received a piece of the action. In 1931, Sunshine State lawmakers passed a racing bill over Governor Doyle E. Carlton’s veto. By 1935, there were ten licensed tracks in operation in the state, some controlled by known criminals such as Meyer Lansky. Dog racing sought to promote itself as elite and glamourous, but the truth about this so-called “sport” has now been revealed in state documents, financial reports and testimony from track workers themselves. Kept in warehouse style kennels, in rows of stacked metal cages for 20-23 hours a day, the dogs are fed a diet based on raw, diseased meat. When let out of their cages to race several times a month, they face the risk of serious injury. Broken legs, crushed skulls, snapped necks, paralysis and heat strokes are common. Some dogs have even been electrocuted while racing. According to information gathered by the state’s Division of Pari-Mutuel Wagering, a greyhound dies every three days at Florida’s eleven racetracks. Cheating is another hallmark of this industry. Over the past decade, there have been more than 400 greyhound drug positives, including 70 cocaine positives. Greyhounds have also been found with pain killers like novocaine and oxymorphone in their systems. Females are routinely given anabolic steroids to build muscle and prevent loss of race days during their heat cycles, a practice which prompts both animal welfare and race fixing concerns. Thankfully, dog racing is now illegal in 40 states, and since 1990, the amount of money wagered on dog racing in the Sunshine State has plummeted by 74%. Tax revenue has declined by 98% and the tracks themselves now lose a combined $34 million. If it were not for a state mandate requiring racetracks to offer a minimum number of races as the platform for other, more popular forms of gambling, this antiquated activity would have ended long ago. Until it does, the state will continue to waste as much as $3.3 million per year regulating this dying industry. Statewide polling shows that Florida voters will vote yes to end dog racing if they are fully informed about its humane and economic problems. You can help the greyhounds by learning more about Amendment 13 and by spreading the word that it’s time to set the greyhounds free. About the author Christine Dorchak is one of the drafters of Florida’s Amendment 13. As president and general counsel of GREY2K USA Worldwide, she works to pass laws to protect greyhounds and promote the adoption of ex-racers across the globe. Since its formation in 2001, GREY2K has helped to close down dozens of American dog tracks and prevented the expansion of commercial dog racing to countries such as South Africa and the Philippines. For more information, go to grey2kusa.org/greyhoundhistory Visit GREY2K USA on Facebook or Twitter. About Amendment 13 If approved, Amendment 13 will phase out commercial dog racing in Florida, prohibiting the activity by December 2020. The measure has no effect on other forms of gambling. Greyhound adoption groups across the country are standing by to bring the greyhounds into loving homes. Learn more about the campaign at protectdogs.org. About The New Barker Heading into its 13th year of publishing, The New Barker dog magazine is reaching upwards of 30,000 dog lovers in print each quarter. A full size lifestyle print magazine, The New Barker features original stories, award-winning photography and always a charming cover of an original work of art by a different artist. The New Barker is all about dogs and the people who love them. Find out where to stay, play, dine, shop and just have fun with your dogs by subscribing to The New Barker, today. Author Anna CookePosted on October 3, 2018 Categories Uncategorized4 Comments on The Last Dog Race?